You’ve got a date, but it is snowing like crazy? Love doesn’t care much about the weather forecast! So how will you get there in time when the road is covered in snow and madly slippery? Mercedes-Benz advertises the company’s 4-wheel drive in a short TV ad. No matter where you’re going, if conditions are bad, you need a car that can handle the situation. 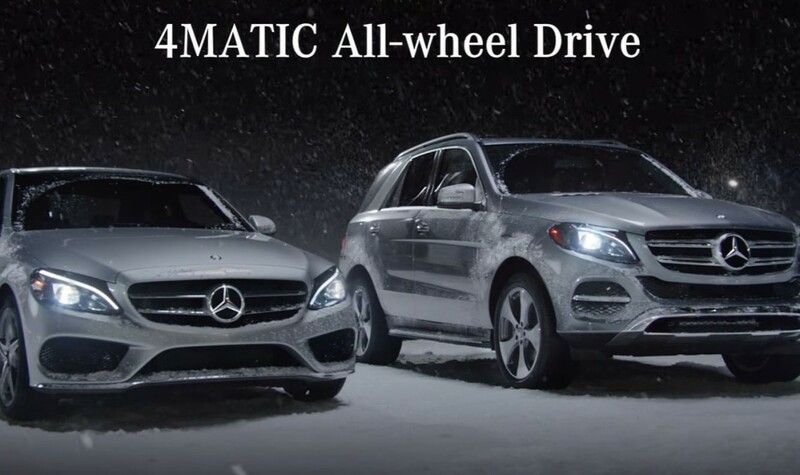 When snow, ice or rain are trying to ruin your plan, you can always count on the Mercedes-Benz all-wheel drive. Because – as the one-minute-and-a-half video shows – there are moments in life that you just cannot miss. And to send out the message in its purest shape, Mercedes chose two young teenagers as main characters. The boy’s father gives him a ride onboard the family sedan, an all-wheel drive C-Class. The young man is taken to the cinema, where he is supposed to meet his date. But there is no one at the cinema except the facility employees. The boy checks the hallway, the cinema theatre and the outside area. Still no trace of her. Will she show up or will he go back home with his heart broken? You must watch the video to find out if the winter story has a happy end or not!